For those who follow my blog, you'll notice a handful of links to the right of my commentary which identifies other bloggers and websites whom I think are insightful and worth your time. One such blogger is Gary Mittelholtz of "Doing Stuff Outdoors" (www.doingstuffoutdoors.com"). I regret to inform everyone that Gary passed away on Saturday following a heart attack he suffered while skiing in Canada. He was 55. For anyone who listened to Gary, they need not meet him to easily notice that he was a very cheerful and happy guy truly in love with the outdoors and passionate about likely the very same things that put a smile on the face of you and I. He was a long-time CBC radio personality from the Toronto area and used his personal time to bring the stories and adventures of many outdoor adventurists to the rest of the world. Despite having never met him, I will miss his contributions to our passion and for the child-like enthusiasm for which it was presented. When I first started going lightweight several years ago, I was very skeptical about guidance which said that weight could be cut by foregoing stuff sacks and pack covers and instead opting for a simple interior liner such as a trash bag or shredder bag. Over time, I realized this guidance was reasonable and functional, although I still elected to use stuff sacks for certain things either purely for organizational reasons or to ensure absolute protection for my most important gear. To me, my "most important gear" which must stay dry includes my down quilt. Simply put, in a pinch when everything goes wrong, I must be able to rely on it staying dry to possibly keep me alive. This alone was plenty enough to ensure I kept it in some kind of waterproof sack. In the past, I used cuben sacks offered by both Mountain Laurel Designs and Zpacks. Both worked fine, but they were far from "absolute" protection because they had an open end usually for cinching shut with a drawcord. So if my pack were unchacteristically submerged in water for example, and water somehow got past the trash bag liner, there was still a chance that my quilt could get wet. At that time, no one was making a dry-bag style cuben sack, so my options were to risk it or get a legitimate dry bag. Fortunately, times have changed. 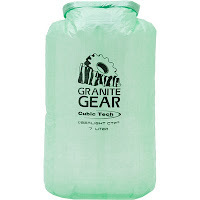 Granite Gear (http://www.granitegear.com/), likely the manufacturer with the most popular thru-hiker packs on the Appalachian Trail, is currently manufacturing an "Uberlight CTF3 DrySack" (www.backcountry.com/outdoorgear/Granite-Gear-Uberlight-CTF3-DrySack/GRG0082M.html). This product is made of CTF3 fabric which is indeed cuben. It is half the weight of silnylon while being nearly five times the tensile strength. One unique feature of the design is that it is sewn squared off which helps prevent dead air in your pack as it will fill space up more evenly. With a roll-top closure, it will really be a step up from a cinching-style sack. Depending on one of the four sizes, it weighs anywhere from .53oz to .74oz and you can find it from $38-$48. I had been sitting on this for a while and decided finally to mention it principally because I really think Joe with Zpacks.com is really innovative in addition to offering excellent customer service. Having spoken with him numerous times, I can't think of anyone in the lightweight backpacking industry who comes across as more genuine, more concerned, more helpful, and just all all-round good guy. I try to always note impressive accomplishments about people I write about, and I specifically wanted to mention that he is a Triple Crowner which is fanfare I haven't seen him seek. 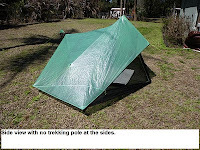 As I mentioned in an earlier blog, Joe came up with the world's lightest tent which he called the "Hexamid" (8.2oz/$269) and will be debuted in June. If you'd like to see a video on it, check out http://www.youtube.com/watch?v=PPa6IisMqKY. Probably no surprise, he decided to offer a two-person version which he is calling the "Hexamid Twin". It comes in at 10.5oz and is estimated at $319. My guess is it will fall shortly after the Hexamid releases as his design becomes finalized. Neither is available on his website yet as these shelters are still in the prototype phase. 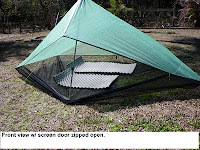 Both tents will have a cuben fiber tarp which uses a nanoseeum screen for walls and a floor. 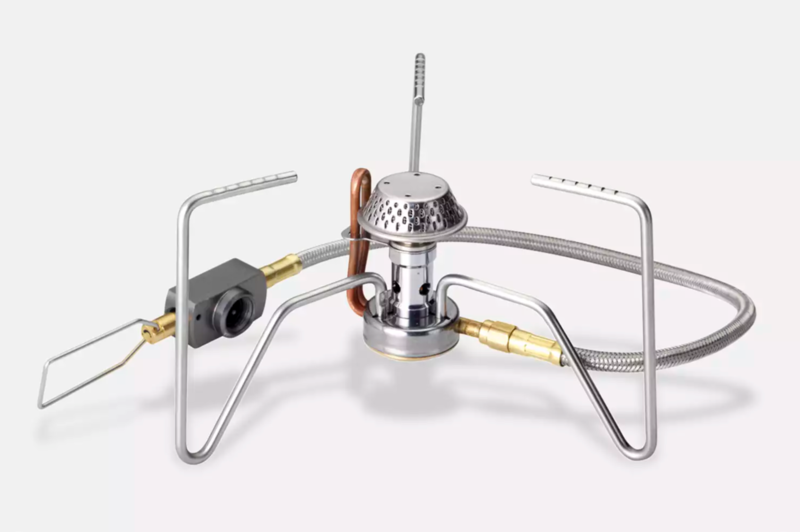 Whereas the Hexamid only uses one trekking pole, the Hexamid Twin uses two to help open up the space. It will also require set up with 6 to 8 stakes. Peak height is 47", rear height 30", length 9', width 5.5', and door height 29". If you are on the fence about the durability of silnylon versus synthetic, check out Joe's comparision video at http://www.youtube.com/user/valesko1#p/a/u/1/8gfcuCh7h04 in which he compares 1.3 oz silnylon to .6 oz cuben and 1.5 oz cuben. 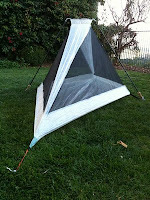 Joe makes his shelters out of .6 oz cuben and packs out of 1.5 oz cuben. The video really helps explain why cuben is such a great fabric being that it is extremely light, extremely durable, doesn't stretch like silnylon, and is waterproof. 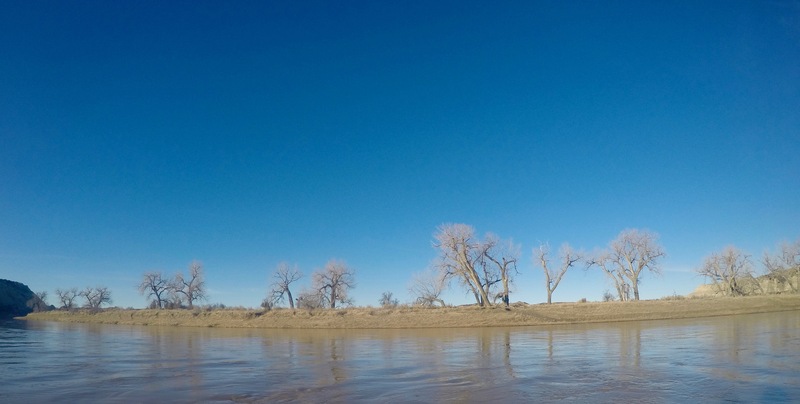 I realize it's been awhile since my last blog and I wanted to express my appreciation to all those who contacted me to make sure I was alive being that my "weekly" blog wasn't up to par. I had a death in the family, a marriage, two bouts of very sick kids, extensive traveling, many work commitments, more snow than I ever wanted, an on-going bout of food poisoning which I wouldn't wish on my worst enemy, and I also put in a lot of time applying to a Grad School with the hope I could change my career path to something I'm more passionite about (i.e. environment/natural resources, etc.). Although I'm not ready to jump back into my blog at this point, I did want to show everyone a picture of the new prototype Gossamer Gear one-person full coverage tent. It looks a lot like the Lightheart Tent which is a knock-off of quite a few other tents from several vendors which already went through their life-cycle. I talked to Grant with Gossamer Gear about this roughly 8 months ago and it's nice to see it finally coming to fruition. 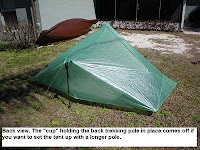 It should be good for tall folks, it looks like it will be cuben and thereby my guess it will be under 24 oz with the fly, and Grant mentioned it only takes two stakes to set up as the trekking poles which helps provide stability and lift will be strapped to the bottom of the tent. I'm guessing the price point will be between $320-$360, but that's just an educated guess.